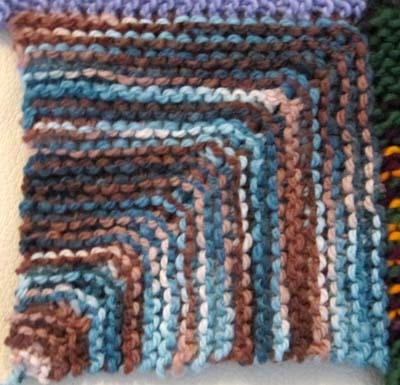 My Travel Afghan is inching towards completion with another block completed. This block represents my trip to Santa Fe, New Mexico. It was easy to find a suitable yarn this time. 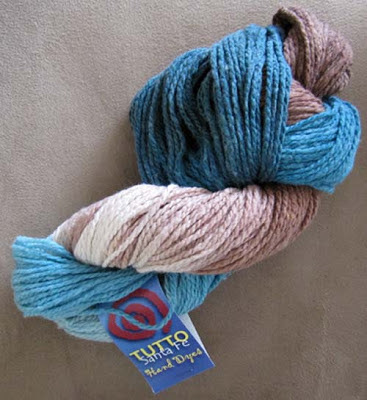 Tutto had yarn that was dyed specifically for them in Southwest colors. I bought 3 skeins, each one different. Slowly I'm collecting yarns for a future Southwest project. I don't know what it'll be yet. Time will tell. Notes: I also bought a skein of Silk Merino and a skein of Baby Boucle in the same colorway for a future project. There are 4 blocks (3 rectangles and one large square) and a border left to finish on this afghan.